In this example, we have created a purchase order, added line items and copies, and activated the purchase order. We will create an invoice from the purchase order, receive items, and invoice them. We will receive specific copies from the invoice. This function may be useful to libraries who purchase items that have been barcoded by their vendor. 1) Complete steps 1-5 in the previous section. 2) The Acquisitions Invoice Receiving screen by default enables user to receive items in batch, or Numeric Mode. 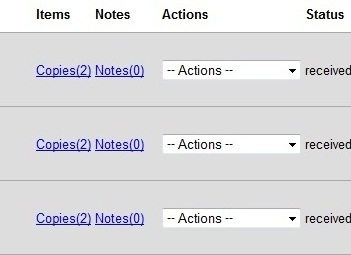 Click Use List Mode to receive specific copies. 3) Select the check boxes adjacent to the copies that you want to receive. Leave unchecked the copies that you do not want to receive. 4) Click Receive Selected Copies. The screen will refresh. Copies that have not yet been received remain on the screen so that you can receive them when they arrive. 5) When all copies on an invoice have been received, a message confirms that no copies remain to be received. 6) The purchase order records that all items have been received.